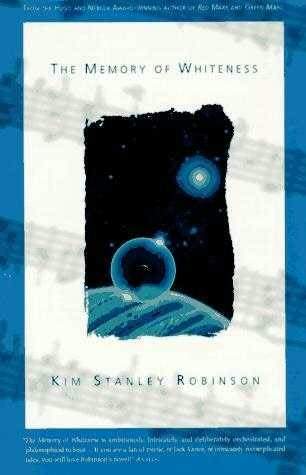 The novel tells of the adventures of a man playing a strange musical instrument traveling throughout the solar system. Ninth master of Holywelkin's Orchestra, blinded at a young age as the result of nepanathol withdrawal; during the withdrawal he hallucinated a conversation with Holywelkin. He embarks on his first grand tour of the orchestra as Grand Master, playing original compositions based upon Holywelkin's equations. A native to the Uranian system, Dent is a music critic who writes for the journal Thistledown. He is selected by the journal's staff to accompany the Grand Tour, where he meets and is befriended by Johannes Wright. Eighth Master of Holywelkin's Orchestra, who selected Wright as his successor against the wishes of Ekern. Pioneering physicist, born on Deimos in the 30th century, who in his final years created the orchestra that bears his name. His Ten Forms of Change ushered in a new paradigm in physics, unifying relativity and quantum mechanics with a ten-dimensional universe and sub-qurak particles known as glints. Chairman of the Board of Directors of the Holywelkin Orchestra; also a high-ranking figure in a metadrama society that is secretly manipulating events during that Grand Tour whose ambition is to replace Wright as master of the Orchestra. Crew manager for the Orchestra's grand tour; a Russian woman from Iapetus. Head grey of the Jupiter system and member of Ekern's secretive metadrama society. Lighting chief for the Orchestra's grand tour; also a member of Ekern's secretive metadrama society. A childhood friend and classmate of Wright's who lived in the shadow of Wright's budding talent at the Holywelkin Institute. Security chief for the Orchestra's grand tour. Known primarily as Red Whiskers through Dent Ios' description of him; one of Ekern's apprentices who frequently tangles with the security team. A member of Karna's security team. Sound chief for the Orchestra's grand tour. A composer and contemporary of Holywelkin; by the time of the novel her compositions have become part of the canon and are considered an artistic response to the paradigm-shift of Holywelkian physics. The short story In Pierson's Orchestra, first published by Damon Knight in Orbit 18 (1976), was altered and became the first chapter of The Memory of Whiteness. It was the first of Robinson's work to be sold. The poem A Poem for Johannes, first published in The Anthology of Speculative Poetry #4 (1980) was altered and became the metalogue that Ekern speaks at the end of chapter 4. Shelley is one of my favorite poets and when I was intensively involved with the Romantic poets, I read his work and the great biography of him, The Pursuit by Richard Holmes, and it seemed to me he was a kind of proto-sf writer, very cosmic, but at the same time a very political writer, a revolutionary utopian. So he was a kind of exemplar for me when I began to write, and The Memory of Whiteness is to a certain extent, a science fiction retelling of his long poem "Alastor". Beyond that I don't know what his influence has been, but I still admire him as one of the greatest English poets. Hello there. Im trying to find the author of a book titled "Holywelkins Orchestra". Doing a brief Google search, returns "The Memory of Whiteness", but this is not the title of the book I read. Did I just have an early edition? Its one of my top sci-fi novels ever. Actually, its my 3rd favorite book ever written, and I read quite a bit. This has not changed since 1993 when I first read it. I was so inspired by it, I created a soundtrack to it. Very amazing read, and thanks for the inspiration!